A bigger, brighter edition of this bestselling classic. Who's there, hiding behind the door? 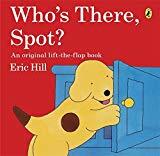 From the pen of the famous illustrator Eric Hill, this delightful hide-and-seek story, with trademark simple text, linked illustrations and lots of surprises behind flaps is perfect for a new generation of Spot fans.